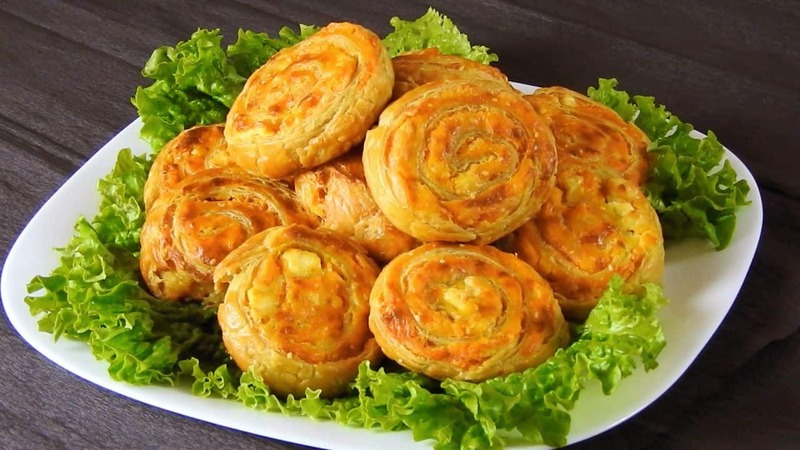 Homemade savoury puff pastry rolls stuffed with mashed sweet potatoes and a combination of Greek cheeses. Simple… easy… delicious!!! Beat the egg and mix it with the sweet potatoes. Stir in the ginger, the coriander and the sesame seeds. Add the semi hard cheese, the feta cheese and the pepper. Stir well. On a floured surface roll out the dough until it gets about 20 x 25 cm / 7.8” x 9.8”. Roll out the first half of the dough into a rectangle 40 x 45 cm / 15.7” x 17.7”. Spread half of the filling evenly on the rolled-out dough. Roll it into a tight log. Cut the log into 12 thick slices. Arrange them on a paper lined baking tray. Flatten them a bit with the back of a spoon. Repeat the process for the other half of the dough. Beat the egg and mix it with the milk. Brush the pinwheels with the mixture. Bake in a preheated oven, at 190⁰ C / 375⁰ F, for 40 minutes. Enjoy!